Manufacturer of a wide range of products which include designer sarees, essential glamorous designer sarees, net designer sarees collections, fashionable and stylish bollywood designer sarees, embroidery fabric georgette designer sarees and evoking georgette designer sarees. We are one of the leading manufacturers, Supplier and Exporter of a wide range of Replica Designer sarees in India. We manufacture and offer a comprehensive collection of Sequin Designer Essential Glamorous Designer Sarees to our valuable clients. In order to render glamorous appeal, these sarees are intricately embroidered.The attractive embellishment and unique color combination make our Designer Saree an ultimate piece of beauty. 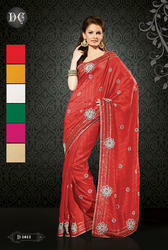 We are well acknowledged for offering a smartly designed range of Net Designer Sarees Collections. Our entire range is designed using optimum quality fabric and latest technology. Due to their embellished and unique patterns these are highly appreciated by our esteemed Customers. We are an acclaimed name engaged in offering our precious clients a superior quality range of Designer Saree. The offered saree is precisely designed with the help of supreme quality fabric and sophisticated tools in compliance with set industrial norms. Our offered saree is worn by ladies to the kitty parties, festivals, functions, celebrations and many other occasions. We do offer a splendid range of Embroidery Fabric Georgette Designer Sarees that will add style to your personality and adorn you for occasions demanding the most elegant of traditional wear. Our professionals at our state-of-the-art manufacturing unit strive hard to produce sarees that appropriately suit the demand of clients and are up to date with the current trends. We are engaged in providing an array of Evoking Georgette Designer Sarees. The offered saree is fabricated by our skilled fashion designers using high grade fabric and modular machines in compliance with set industrial norms. We offer this saree in a number of designs, patterns and shades as per the information laid down by our clients. We have captured the market by offering our customers with captivating Party Wear Amazing Classic Designer Sarees, which are ideal for parties and made from excellent quality fabric sourced from a reliable vendor base. The products are known for their durability and strength of material. The product is made from high grade fabric procured from an authentic vendor base and checked for quality. We are the prominent manufacturer and supplier of Art Silk Designer Indian Sarees, which are a fusion of traditional and modern designs. The sarees are stylish and made of good quality fabric procured from a reliable vendor base. They are color retaining and extremely durable. We are specialized for handling bulk orders owing to the sophisticated manufacturing unit we harbor and are prompt with deliveries as well. Our range of Latest Fashion Designer Sarees are available in exclusive designs and beautiful colors. These vibrant saree are in wide demand in the market due to their excellent quality of fabric, flawless workmanship and tempting designs. Our designers design these Designer Party Wear Sarees using premium fabric, ensuring high comfort and attractive patterns. We are engaged in making and distributing a wide range of Party Wear Designer Embroidery Work Beauty Sarees to our clients and the ultimate users from various geographical locations. We manufacture these using latest technology and fine quality fabric which we sourced from the trustworthy vendors of the market. We are manufacturer and wholesaler dealing in Hand work Beauty Designer Sarees. This fancy designer party wear saree has been crafted with lovely design all over saree. This simple designer saree is simple but its color combination makes this attire glowy. We are engaged in manufacturing and exporting quality assured range of Cotton Beauty Designer Sarees, which is ideal for casual as well as parties and weddings. . This fancy designer party wear saree has been crafted with lovely design all over saree. Our clients can avail from us the most exquisite and enticing array of Green Party Wear Ultimate Desire Designer Sarees. These beautiful sarees are designed by our trustworthy vendors using skin-friendly fabric. These Sarees are in wide demand in the market due to their excellent quality of the fabric, flawless workmanship and tempting designs. Looking for “Embroidered and Replica Bollywood Sarees”?